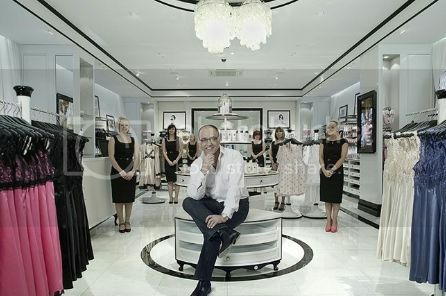 Earlier this week, I was kindly invited to the launch of beautiful lingerie shop Boux Avenue at The Metro Centre. 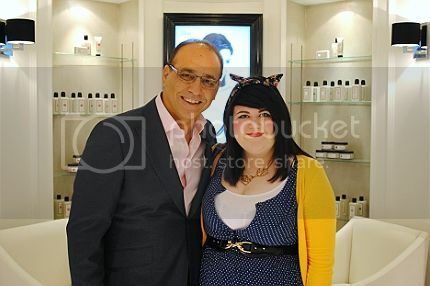 Owned by retail giant (and dragon) Theo Paphitis it is the first of it's seven stores to open in the North East. We all got to meet Theo, who is absolutely lovely and passionate about what he does. He explained to us how underwear shopping shouldn't come hand in hand with everyday shopping - in his own words: "You shouldn't need to buy the most intimate clothing you own in the same store as you buy frozen chicken." Boux Avenue is warm, welcoming and aesthetically beautiful - inspired by Parisian boutiques, with displays of overflowing suitcases and drawers full of their wares in a large range of sizes. Also sold are beauty products such as hand creams, body polishes and lip balms (more below), pyjamas (all added to my Christmas list) and even beautiful vintage-inspired greetings cards. The girls working there are clued up about underwear, and all wear matching Audrey Hepburn-esque black shift dresses. I LOVED that the staff are however able to wear their choice of footwear - we saw everything from skyscraper bubblegum pink stillettos to sensible black ballet flats! 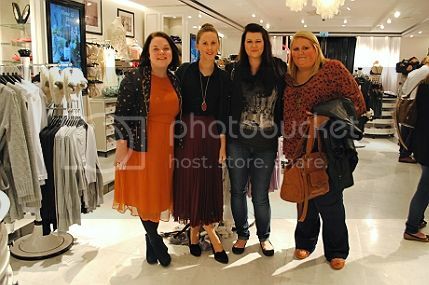 I was so happy to meet some fellow Northern bloggers, as all the events I have attended so far have been in London. They were all adorable, and later went for coffee to discuss blogger-y things further while we munched our free cupcakes. The Boux girls with Daniella from Madame Gourmand and Katie from Lady From a Tramp. 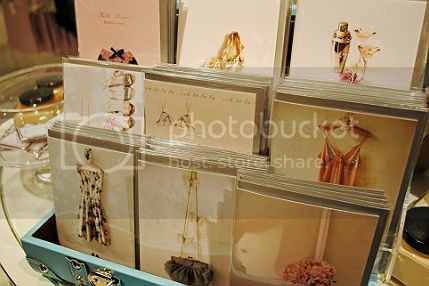 We also met Victoria from The Window Shopper but I didn't get to snap a picture - next time, definitely! We were all given very generous goodie bags with White Chiffon hand cream (lily, jasmine and elderflower), rose lip balm, a pair of frilly french knickers, lemon cupcakes and a gift card. 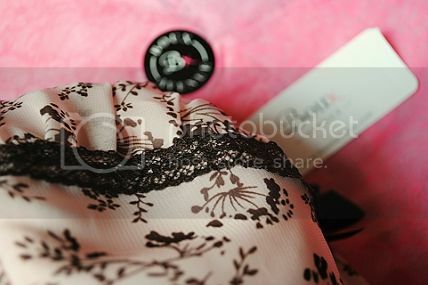 With this I treat myself to a Blossom Balconette bra - I even bought another with my own money and I loved it so much. I'm not going to give away my bra size - but put it this way, I can sometimes struggle to find lifting and supporting bras which are also very pretty. This one fits me perfectly, and Boux Avenue even have a deal on at the minute where for every bra you buy, you recieve a pair of matching knickers absolutely free! Oh yes, matching undies for everyone: no excuses now girls! Most sets come with the option of (Keep your filthy paws off my) silky drawers or a tho-tho-tho-tho-thong! Right, now I've got songs from Grease and novelty R&B from the early 00s stuck in my head I think I'll sign off. It's for the best methinks. Be sure to give Boux Avenue a look if you have a local store - and they're also available online. There's another big event coming up at the Metro Centre this week, but hang tight - I'll do a separate post about that! For a hint though: be practicing your model grrrl walks. DISCLAIMER: I recieved no money for writing this post. As always - ALL opinions are my own! wow... everything is so pretty! And the shop looks FANTASTIC! 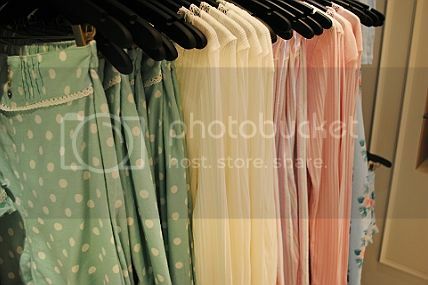 Can't take my eyes off of those gorgeous mint polka dot jammies! I agree that it feels silly choosing your intimates in the same place you buy your cereal and so forth, I'm guilty of doing that myself (even recently). It is hard for me to find bras in particular that I like and that I find pretty, oh the joys of being large and large breasted - blah. You look super cute as always and thanks so much for sharing this with us, looks like you had a divine time. 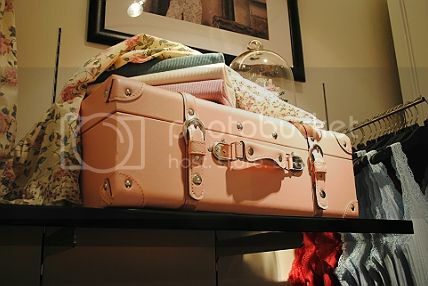 I love that pink suitcase, so adorable! it's cool that you got to meet theo, it just gives an impression that he really cares about the business. Also great that there are blogger events up North!